Welcome to Matron's 2010 Dogblog! 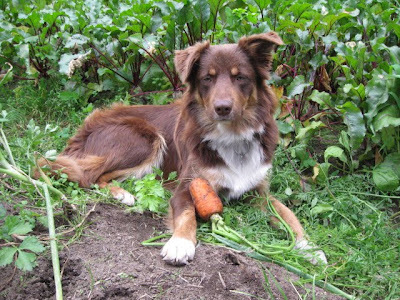 It is time to celebrate our canine gardening chums! The two best things in life are dogs and gardening - so this is celebrating both. A big thank you to everyone who sent pictures! An even bigger thank you to the patient dogs who posed for photographs! So here is the 'dogfather' of them all. 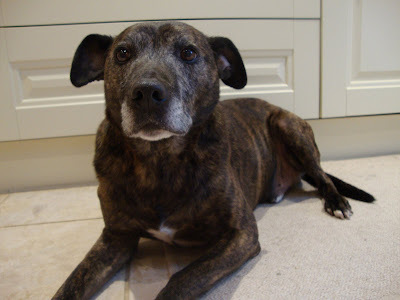 My Buddy is 14yrs old, a rescue dog from Battersea dogs home. He has the most personality of any dog I've ever owned. His parentage is 50% Beauceron, 25% Border Collie and 25% Dalmatian!! 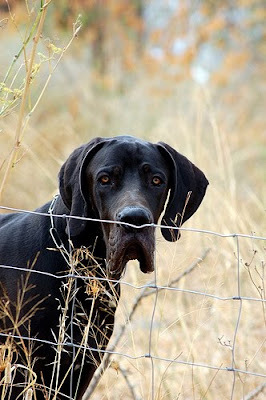 He is also the inspiration for my new Company Blackdog . He hates having his photo taken and if it wasn't for me holding a big chunk of chicken above the camera he wouldn't have bothered! 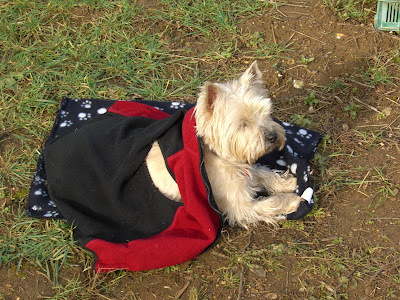 Rebus the cairn terrier lives with Kay and enjoys supervising on the allotment blogger's plot. Carrie, aka the blonde bombshell loves to nibble sweetcorn cobs. She lives with Sue and is aptly named because she carrie's things around, she even helps sue empty the washing machine. Goober lives in Nairobi, actually he is Buddy's honorary Nephew. Found wandering the streets in Lisbon, and is now a globetrotting diplomat! 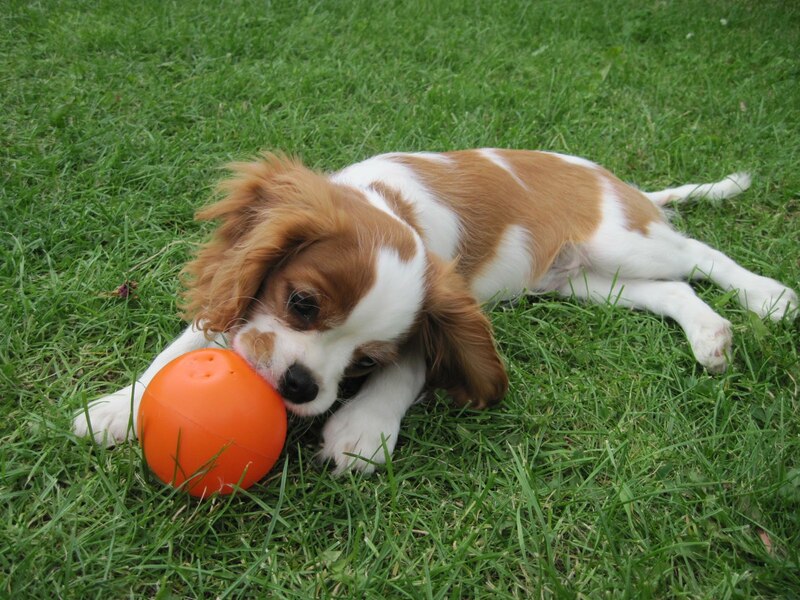 Polo, aka 'the plot defender' is just such a little cutie! she is a rescue staffie cross and lives with Damo at the Two Chances Veg Plot. She keeps pigeons at bay and destroys sticks! Go for it girl! those sticks need to know who's boss! this is Tara the terror! She lives with Yolanda at Bliss Garden in the Netherlands. Tara is a kooikerhund, a duck decoy dog! Tara just loves cats, drinking from the new water fountain, and getting mud on her face! Archie lives with Jo at Through the Keyhole. He is a 4 month old Cavalier King Charles spaniel. Jo says he is more of a hindrance than a helper, and is hoping that he will grow out of his habits. Jo - I'm afraid he won't - you'll just learn to love them! Rowdy lives with Mike at the subsistence pattern food garden. 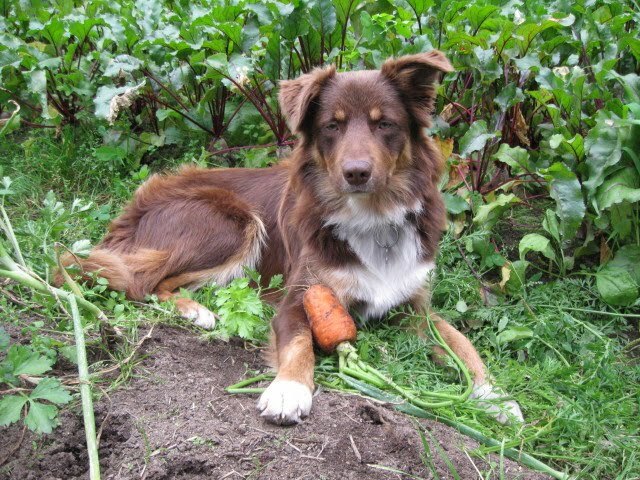 What a beautiful dog, and it looks as if he likes his root vegetables too. Very sensible! Gwyn , oh Gwyn! how did you get to be so beautiful? 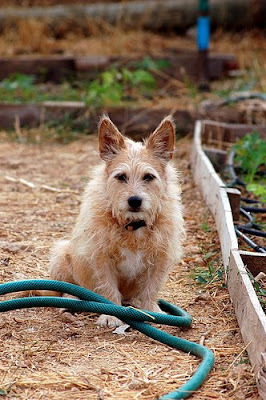 Gwyn has just been promoted to head gardener at veg patch blog. Brains and beauty! Bobby is one of the few veterans from my previous dogblog. 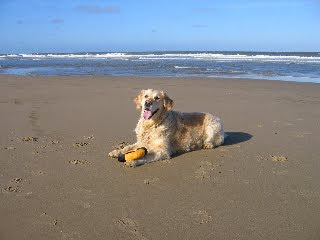 He lives in Lincolnshire with John at Midmarsh. 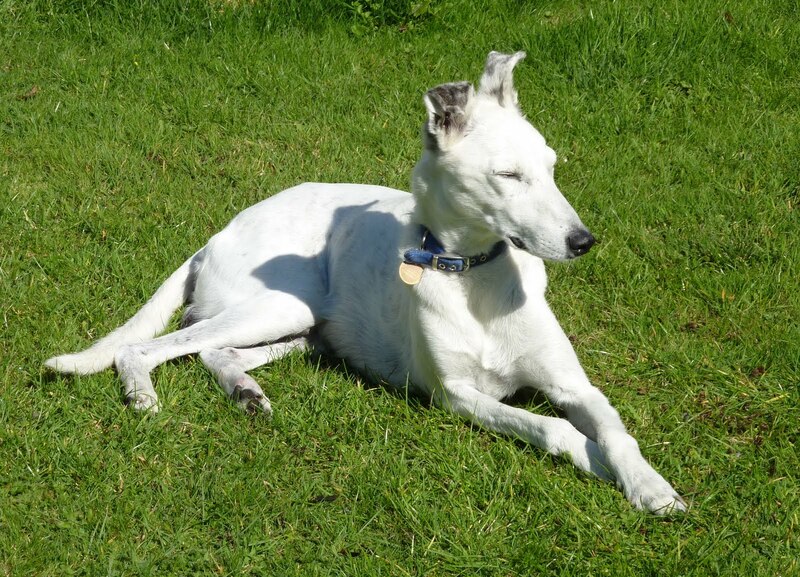 Bobby is a rescue Lurcher and believes that supervising is a good excuse for sunbathing. Keep at it Bobby! Pickle is aptly named because he keeps getting into a pickle! Makes friends easily, not only with the Vegegable Vagabond, but with the cows next door! What a sweetie! Maria Antonia lives in Portugal at Jardim com Gatos. You can see from this picture that she wears a coat of natural authority, a born leader. She likes to chase flies and also hunts for mice and lizards. No messing with this girl...unless you happen to be..
Draco the giant puppy. Draco lives with Maria Antonia but he is not allowed into the veg garden, just think of the mess those giant paws would make. That doesn't stop him sitting outside the garden looking sad! Holly the Border Terrier takes a break from helping Joy. 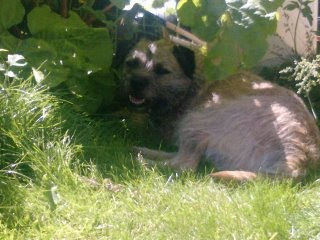 Here she is in the shade from one of the hot spells in the North East this Summer. 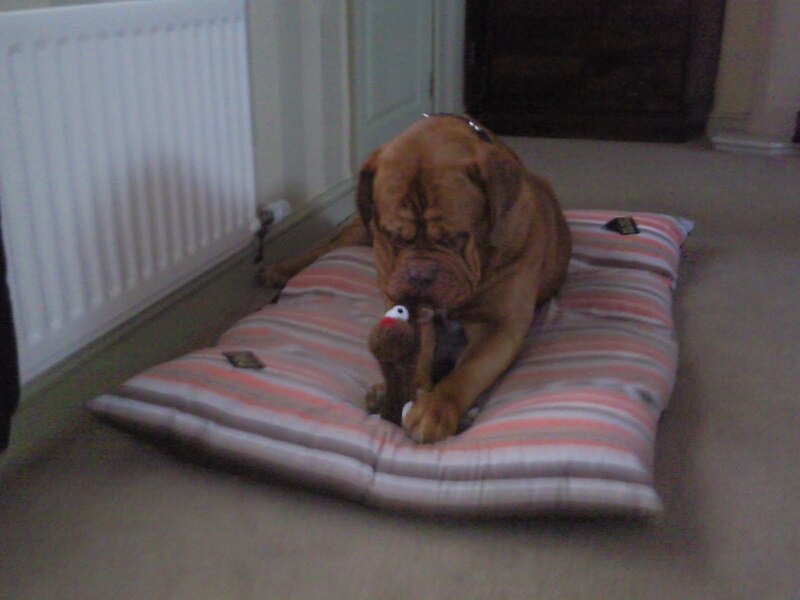 Samson is a 4 year old Dogue de Bordeaux. This gentle giant lives with the Happy Plotter. Tara and Niki live with the Hills and Plains Seedsavers. Here they are sunning themselves in the garden this Spring. Wyatt is clearly a veggie dog! He is so famous they named a blog after him. Wyatt Gardens! 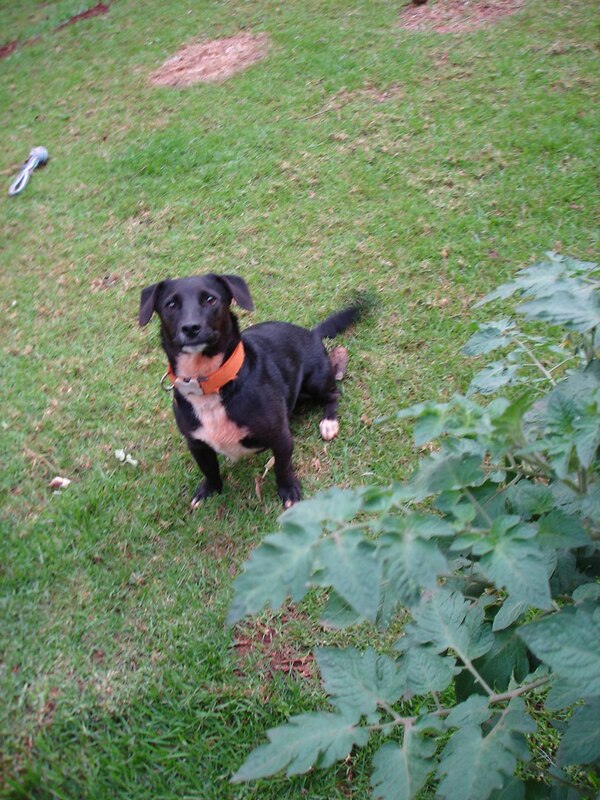 This post has been brought to you by Blackdog, DNA tests for mixed breed dogs! A million thanks, pats, and cuddles to everyone! Things are really slowing down on my patch at the moment. It won't be long before I'm blogging about 'my favourite trug' for want of a better subject. But there's still lots of life in the garden. I've had my best crop of parsley ever this year! I had always assumed that because it is a dark green, lush colour that it might like growing in a damp shady corner. This year I planted flat leaved and curled parsley in a raised bed in full sun! The bed had been very well manured each year for previous crops and it had a deep root run. Amazing stuff! I kept thinking of excuses to eat parsley all Summer. Any other ideas, anyone? A few Winter lettuce seedlings and Swis Chard seedlings have been planted in a large pot on the patio. I must have a mouthfull of Winter greens every so often! I left the last crop of Runner Beans to go to seed, it is such an easy crop to grow here in my London clay soil, it would have preferred a bit more rain this year, but this variety St George did very well. - But not well enough to fork out for these expensive F1 hybrid seeds next year. I think I'll use home saved ones next year. Not much difference. I think I'll leave these sweetcorn stalks to stand in the garden all Winter. They just provide a bit of shape and interest over the dull and dingy Winter months. The birds like to perch in them too! Just look at these Bramleys! If you leave them to ripen for a few weeks more in the sunlight, you get the most amazing colour! You can see here why it is a good idea to thin the apples down to singles - much too close to each other, critters have taken up residence in between them! - well, that's two more for the pie then! Now this is a picture that will bring back happy memories when I look at it next February or March! I made a tomato salad this afternoon. The ingredients are the best of everything! Fresh picked tomatoes, extra virgin olive oyl, balsamic vinegar, buffalo mozzarella... needless to say it was divine! Just think of those long, long Winter months when all we have to eat here is crunchy, bland, tasteless, awful supermarket tomatoes. Enjoy them while you can! I love watching how plants react to the seasons! Plants are so sensitive to day length, strength of sunlight and temperature and they respond in colourful ways sometimes. These are some Scotch Bonnet chillis that I grew from seed saved from a chilli bought in a West Indian market stall. You can see that they are responding to the shortening day length and cooler nights by turning colour. Just in a couple of days these two orange coloured ones went from green to orange, then will go to red. This is the same process involved in tree leaves turning colour in Autumn when they respond to the seasons. This one above you can just see starting to change, in only a day or so it will turn colour. These are fairly small plants and I might bring one indoors as a beautiful houseplant on a bright windowsill. This little chap is a 'Bishops Kiss' chilli. I look forward to saving seed this year and growing more next year. If you grow pumpkins or courgettes then this powdery mildew will be a familiar sight at this time of year. It happens every year, it looks horrible but it just seems to be inevitable that the plant will get this at the end of the season. I have heard of people using various home concoctions sprayed onto the leaves, but it only delays the inevitable. It usually happens in dry conditions, but I just try to keep my plants well fed and watered for as long as possible. Elsewhere, I am enjoying watching my Christmas Dinner growing on the plant. This is the first time I have grown Brussels Sprouts, and this variety Bosworth seemed like a good one to me. These Crab Apples are looking glorious at the moment. I am always torn between leaving them on the tree for some lovely Winter colour in the garden, and to feed the hungry birds in the garden - or pick them all and make crab apple jelly. I can't decide! 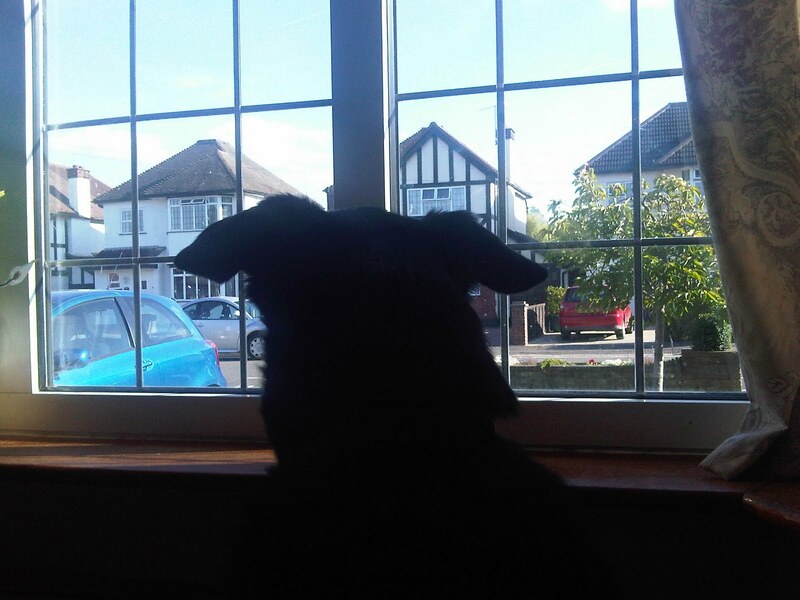 Finally, just another reminder to email me a picture of your faithful canine garden companions for Matron's 2010 Dogblog. Send me a picture before September 29th and please include your blog address if you want me to put a link in. This old lady is my ex-dog Emma. 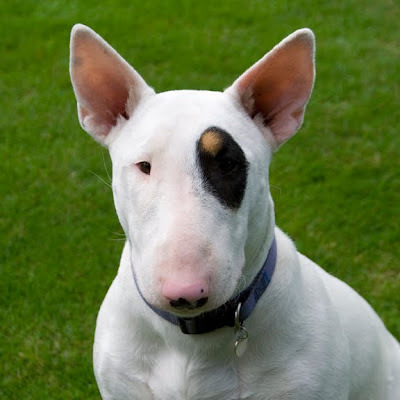 We rescued her from Battersea Dogs Home in the 1970s and she was a fun and loyal companion for many years. I just found this photo, she had just been playing snowballs with me in the garden! Just a few tips on an easy way to save tomato seed. Pick the biggest, best, healthiest outdoor tomato you can find and make sure it has stayed on the plant to really ripen properly. Squeeze the seed out into an egg cup and add just a couple of teaspoons of water. Leave this eggcup on a warm windowsill in the kitchen for several days. The tomato pulp surrounding the seed will start to ferment and break down a little, allowing you to separate it from the seed more easily. Don't worry even if a little mould appears on the surface of the pulp, that is fine, so long as the tomato flesh starts to decay it is ready. Gently wash the seeds in a sieve and rub with your fingers to separate most of the surrounding pulp from the seeds. You won't get it all, but get as much as you can and this will prevent mould forming on the dried seeds through the Winter. Spread out the seeds on a plate and separate them. When they are completely dry you might have to scrape them off the plate to store them in packets. It struk me today when I was looking at my recent pickings, what a wonderful array of colours I have in my harvest. It is always a healthy thing to eat your way round different coloured foods, so I should be bursting with health if this photo is anything to go by! Then I had another look round my patch to see any other bursts of colour.. These bright Lemon tomatoes are just starting to ripen, what a vibrant lemon yellow! One by one my Scotch Bonnet chillis are turning colour. and these San Marzano plum tomatoes are an amazing colour too! and with the addition of fresh turmeric, ginger and English mustard - I will be looking forward to tasting this new, colourful batch of Summer pickle! 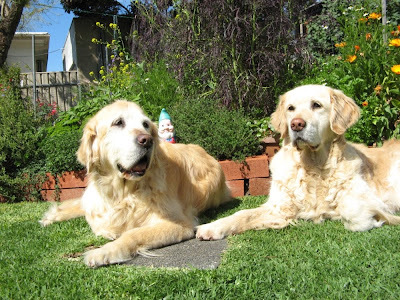 There's still plenty of time to go and take a picture of your canine gardening helpers, supervisors, head gardeners for Matron's 2010 Dogblog. Please email me your photos before September 29th, and don't forget to send me your blog address if you want me to put a link into the post! It has been a great year for my Bramley apple tree. I think the long hard Winter helped to develop lots of fruiting buds on the tree. There have been plenty of windfalls, but this weekend I picked the perfect fruit that was ripe (it came off easily when pulled). These will be laid carefully in the cool, dark garage. They should keep until next Spring. I found these plastic trays being thrown out at my local garden centre. They are just the job for storing apples! I pulled up the first of my Oarsman leeks for lunch today. Lots of length to the stem, and beautifully tender and flavoursome. I steamed some Tromba D'Albegna squash too, easy to peel and slice. I steamed the squash, but have to say that although the flavour was fine, it was quite watery. F1 Hybrids - Worth the Money? Lots more veggies are ripening down on my plot this week. I've picked some of these Trombocino squash, also known as Tromba D'albegna. Some can grow to almost a yard long, and will readily curl round if they meet an obstacle while they are growing. Some I have left on the plant to ripen more, some I have picked because the vines were dying back anyway. Supposed to be related to a butternut squash, the seeds are found in a small area at the bulbous end of the squash, otherwise the whole of the rest of the squash is seed free and can be cut into discs. They come in all shapes and sizes and should ripen to a butternut colour. Elsewhere on the plot diversity is the spice of life. My large golden beefsteak tomatoes Golden Jubilee are finally ripening. These are a late variety and have an outstanding flavour and are very prolific too. They just look lovely sat next the the chocolate cherry tomatoes and the F1 hybrid Dombito Beefsteak. Which brings me to the question of F1 hybrids. Here are my new F1 hybrid runner beans St George. Is it really worth the money to buy expensive F1 hybrid varieties? You are supposed to get a 'hybrid vigour' with a first cross, but can you really tell the difference? I can't. Certainly cheaper (free actually) to save my own seed for next year and I don't think I will notice. I'm excited that these Bishop's Kiss chillis are growing. They were a very late prezzie from my good chum Stan. These remind me of the type of chillis that include the variety 'Friars Hat'. A bell shaped chilli with a skirt round the bottom. Fingers crossed we have some more bright weather to encourage these along. And these are my F1 hybrid leeks Oarsman. Again there were only about 30 or so seeds in the packet!! I'll see how they stay over Winter and what the flavour is like, but I might return to my old pal Musselburgh next year. You get 10 times the number of seeds for your money. Perhaps one exception to the rule is this all female F1 cucumber Tiffany. Just so brilliant to get no male flowers at all! I wish someone would breed a pumpkin or squash with no male flowers! This was a later planting that I planted outside. It has grown and grown, I have tied in lots of sideshoots and looked after it. Highly recommended. Well done Tiffany!